ALBANY, N.Y. (01-Jun) — Allie Kieffer had hoped to run 2:33 at last November’s TCS New York City Marathon, an ambitious goal which would have been more than an 11-minute personal best. Staying in control, the 30 year-old athlete stuck with her race plan, hitting halfway in 1:16:39, 20 seconds behind the lead pack. At that point she checked herself and realized that she had a lot left in the tank. She could pick it up, she thought, and maybe catch a few people. In a brilliant piece of running, Kieffer slowly picked up her pace, running the second half in 1:13:00 and the last 10-K (from the 20 mile mark to the finish) in 34:18. She ended up passing every woman, but four, and nearly caught two-time world champion Edna Kiplagat of Kenya who only finished three seconds in front of her. She stopped the clock at the Central Park finish line in 2:29:39, a time that would make her the ninth-fastest American woman for 2017. “I didn’t realize at the time that I was just having a phenomenal day,” Keiffer marveled. That performance landed Kieffer a sponsorship deal with Oiselle, and greatly raised her sights. Her management agency, Flynn Sports Management, secured an invitation for her for the Virgin Money London Marathon last April, and a personal best 1:10:40 half marathon victory in Doha, Qatar, last January had her feeling even more optimistic. The injury devastated Kieffer. She had broken the second metatarsal bones in her right foot, and had to stop running completely. After literally limping onto the plane to leave Kenya, she flew back to the States, and hoped for the best. Because she had had half a dozen stress reactions before in the same spot, Kieffer was determined to find out the root cause of the problem. She suspected it was a mechanical problem, and with the help of Oiselle, she visited a physical therapist in Bend, Ore., Jay Dicharry, to try to figure it out. Dicharry helped mobilize her foot to encourage a change her form so that she wouldn’t put as much stress on her second and third metatarsals. She was striking too far on the outside of her foot and rolling in. She needed to move more of the strike force to the larger, first metatarsal. “There were a lot of things that were tight in my foot, obviously, running my whole life that way,” Kieffer lamented. It was slow going, and the treatments with Dicharry were painful. Kieffer had been in such tremendous shape in Kenya that she thought she could bounce back quickly once her fracture had healed, but that’s not what happened. 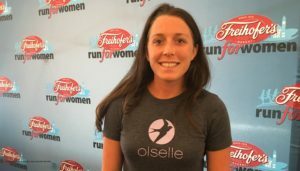 For tomorrow’s Freihofer’s Run for Women 5-K here, where Kieffer is part of a 21-women elite field, she will dip her toe into racing for the first time since January, and she’s not sure what to expect. She feels like her training is coming along, but as a marathoner the 5-K hardly gives her time to warm-up. In addition, she’ll be facing strong track racers like Jessica Tonn (5000m personal best of 15:18.85) and Sarah Pagano (15:18.57) who are sharpening up for the national championships on the track. Kieffer is trying to be keep the long view, and sees tomorrow’s race as a stepping stone to running another great marathon in the fall. This will be the 40th edition of the Freihofer’s Run for Women, which was founded in 1979 and was originally held in the early spring. Organizers expect some 3000 women, and Kieffer feels that she is in a supportive environment here where she can get in some active healing.